The new ChamberTite Vent Stack Chamber is suitable for upto 8 risers. It consists of a watertight polyethylene chamber and rigid vent stack securing framework. Standard unit included two supporting cross members. Additional cross members available if required. 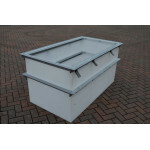 The Chambertite Vent Stack Chamber 1500 x 800 x 800mm ..